Hey Kids! 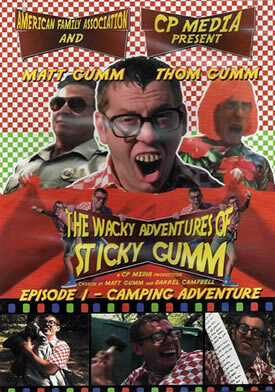 Come along with Sticky Gumm in his first ever wacky adventure! When Sticky's mother gives him too much work to do, he decides to pack up and run away from home. The narrator suggests he try camping and we're off at the speed of laughter! Combining the zany antics os seasoned comedians Matt and Thom Gumm, "The Wacky Adventures of Sticky Gum" is a delight for the young and old at heart. Things are gonna get wacky! ORDER DVD ONLINE : FIRST 5,000 FREE! Just pay $5.97 S&H - Now THAT'S WACKY! Copyright 2012-2018. Amazing Media. All rights reserved, worldwide.